Receipts were 1435, including 372 packer cows, bred cows and pairs, 1063 yearlings and calves. Packer cows were $1 to $3 higher. Packer bulls were steady to $2 higher. Market on bred cows and pairs were $100 to $150 higher. Market on steers, bulls and heifers weighing 500# and under were $5 to $10 lower. 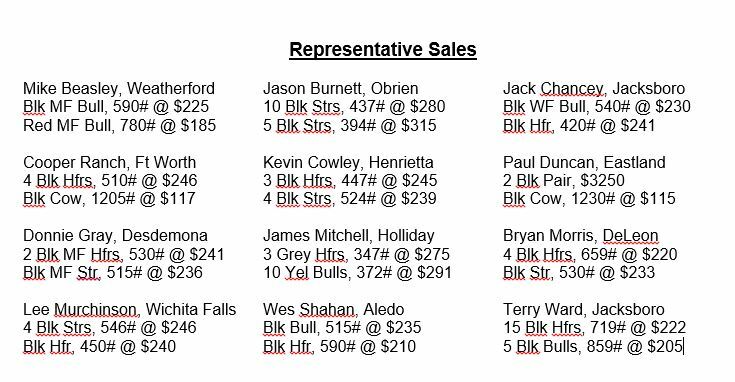 Feeder steers and heifers weighing over 500# were steady with the bulls being $6 to $12 lower. The market on cows was a little higher, the calves & yearlings market was cheaper. SEE YOU MONDAY AT GRAHAM LIVESTOCK! Receipts were 1137, including 140 packer cows, bred cows and pairs, 997 yearlings and calves. Packer cows were steady to $2 higher. Packer bulls were steady. Market on replacement cows and pairs were steady on the better kind. Market on steers and heifers weighing 500# and under were steady on the better quality calves. Feeder steers and heifers weighing over 500# were steady. The market was steady to strong on all classes of cattle. Receipts were 1379, including 276 packer cows, bred cows and pairs, 1103 yearlings and calves. Packer cows were $1 to $2 higher. Packer bulls were steady to $2 higher. Market on replacement cows and pairs were steady to $75 higher on the better quality cows. 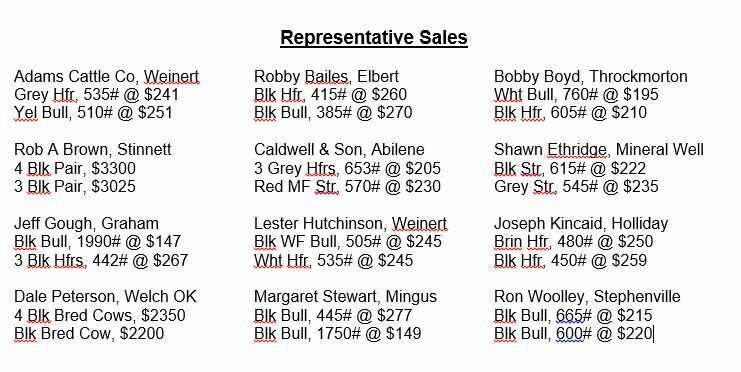 Market on steers and heifers weighing 500# and under were steady to $3 higher on the better quality calves. Feeder steers and heifers weighing over 500# were steady. 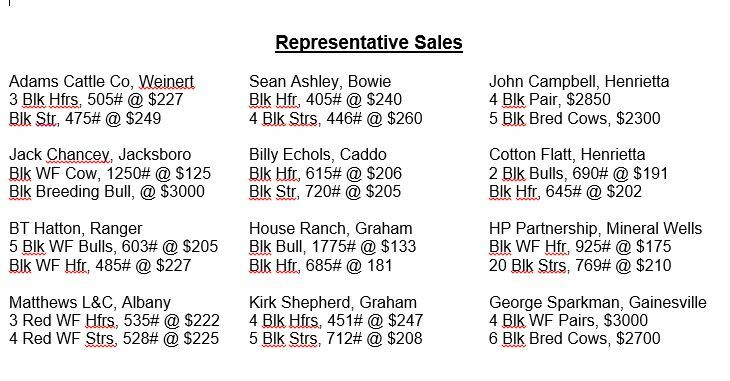 The market was strong on the better quality cattle. Buyers are being very selective on the quality. Receipts were 800, including 225 packer cows, bred cows and pairs, 575 yearlings and calves. Packer cows were steady to $2 lower. Packer bulls were steady to $3 lower. Market on replacement cows and pairs were steady on the better quality cows. Market on steers and heifers weighing 500# and under were steady on the better quality calves. Feeder steers and heifers weighing over 500# were steady to $3 lower. We had a lighter run today due to the Fourth of July weekend but the market is still holding pretty strong.